New York City Stage: After 20+ Years, I Return to "Radio City Christmas Spectacular"
After 20+ Years, I Return to "Radio City Christmas Spectacular"
I'm not sure what took me so long but after 20+ years, I returned to the 6,000 seat Radio City Music Hall to see the annual Christmas Spectacular, starring The Rockettes. In 90 solid minutes, I had a 3D video game experience, saw some fireworks, stared up at snow and watched a couple of ice skaters. 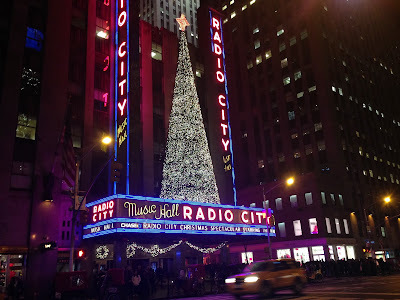 Of course, I also marveled at the precise synchronization of The Rockettes, the nativity (camel and all) and Santa. After 20 years, I was pleased to see that today's Christmas Spectacular balances the traditional and the modern. I didn't appreciate staring at sponsor Chase's blue logo the whole time, but in my opinion, the show remains a wonderful family experience this time of year. Let the holiday season begin! !